Spain's Jorge Lorenzo overtook Valentino Rossi at the top of the MotoGP world championship standings after a commanding victory in difficult conditions at the French Grand Prix in Le Mans, AP news agency reports. Slippery conditions made the going difficult for the riders early on in race four, with the majority being forced into the pits to change tyres. Valentino Rossi, who was looking to extend his lead at the top of the standings, was one of them. It would turn out to be an afternoon the Italian would rather forget, as he crashed out shortly after coming out of the pits, and would eventually finish last, which has cost him the championship lead. However, it was a completely different story for Jorge Lorenzo as he cruised to victory, but also not without problems, as the Spaniard had to change his bike during the race. Marco Melandri and Dani Pedrosa were left to battle it out for second and third spots on the podium. Lorenzo now moves to the top of the championship standings by a point from Rossi and Casey Stoner. “It was a very difficult race because I am not used to change the bike in the middle of the race and this was the first time in my life that I have to change it. 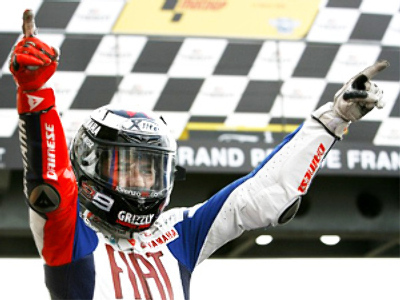 So, I'm completely grateful with this victory,” Jorge Lorenzo said.